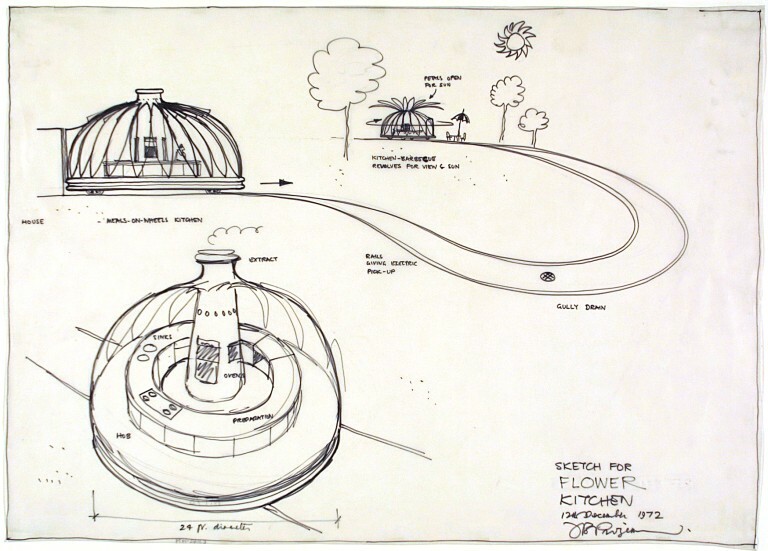 This sketch shows the first ideas for an extraordinary kitchen designed by the British architect John Prizeman in 1972. The kitchen detaches itself from the house and moves around the garden on rails. Shaped like a flower, it rotates on its axis and its windows open like petals as it follows the sun. Prizeman’s clever choice of drawing materials helps to convey this narrative. The smooth tracing paper becomes the garden and the kitchen whizzes across the surface as effortlessly as his felt-tip pen. The flower kitchen reflects both the ‘flower power’ culture of the period and the decorative style of early Victorian conservatories. A kitchen based on this design was manufactured as a one-off project by the American company Westinghouse Domestic Appliances. 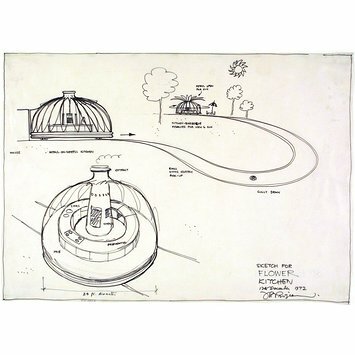 Drawing in felt-tip pen on tracing paper with three views of a dome-shaped outdoor kitchen with petal-shaped windows. Inscribed with captions and dimensions. Title, signature and date inscribed at bottom right. SKETCH FOR/ FLOWER/ KITCHEN/ 12th December 1972/ J B Prizeman. John Prizeman designed this kitchen in conjunction with Westinghouse Domestic Appliances. The design was inspired by early Victorian decorative conservatories. The kitchen was a mobile unit which could detach itself from the house and travel about the garden on rails, revolving on its axis and opening its 'petals' to make best use of the sun. An example of the kitchen was manufactured for a client. Design drawing in felt-tip pen for a mobile kitchen in the shape of a flower, by John Prizeman in conjunction with Westinghouse Domestic Appliances, 1972.